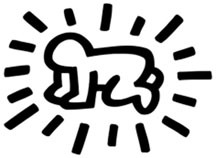 I have fallen in love with the art of Keith Haring. It just makes me happy. I love the simplicity of his art, as well as the messages he sends to us of tolerance and unity through his images. He has left a wonderful legacy of images that represent love an d positive messages. How can you not help but smile when you look at his art? In the classroom, we focus on how Keith Haring shows movement, as well as the simplicity of his art. He generally uses bright and solid primary and secondary colors and lots of color … hardly any white space … and outlining his images in black. There are very few details in most of his work and he does a great job of showing movement through the placement of lines. We also talk about “underground” art and street art, which is how Keith Haring became noticed – with his N.Y. Subway wall murals. Even though “street” art is sometimes considered grafitti and the artists can’t sign their names, they have their own icon or symbol so people know who was the “contributor”. Keith Harings was known as the Radiant Baby. 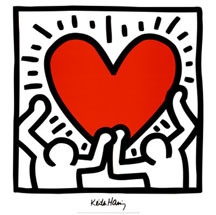 You can see how Haring included it as a “signature” in much of his early work. The artwork we actually do is another “new” form of art… Artist Trading Cards. Just like baseball, football, Pokeman cards, artists create their own Art Cards to trade with other collectors and artists in the medium they are known for. There are actual conventions held for trading! We did ours in the Keith Haring style of something or someone in “motion”, simply using Sharpies for the flat color Haring always used. After focusing on the art and outlining everything in black, students made sure they included their lines that showed motion. They turned out fabulous, if I do say so myself!